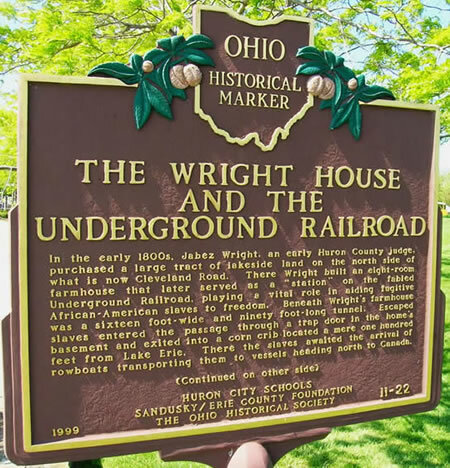 In the early 1800s, Jabez Wright, an early Huron County judge, purchased a large tract of lakeside land on the north side of what is now Cleveland Road. There Wright built an eight-room farmhouse that later served as a “station” on the fabled Underground Railroad, playing a vital role in aiding fugitive African-American slaves to freedom. Beneath Wright’s farmhouse was a sixteen foot-wide and ninety foot-long tunnel. Escaped slaves entered the passage through a trap door in the home’s basement and exited into a corn crib located a mere one hundred feet from Lake Erie. There the slaves awaited the arrival of rowboats transporting them to vessels heading north to Canada. (Continued on side two) Text: Side B (Continued from side one) After the passage of the Federal Housing Act of 1949, a concerted, nationwide effort toward modernizing aging urban areas began. 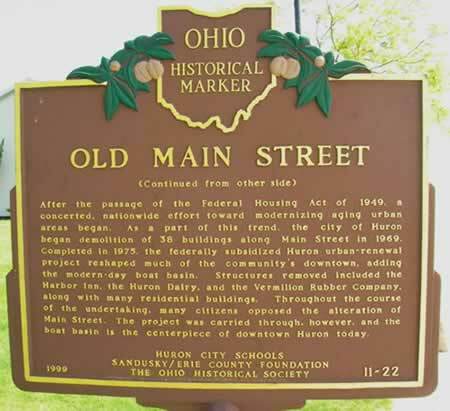 As a part of this trend, the city of Huron began demolition of 38 buildings along Main Street in 1969. Completed in 1975, the federally subsidized Huron urban-renewal project reshaped much of the community’s downtown, adding the modern-day boat basin. Structures removed included the Harbor Inn, the Huron Dairy, and the Vermilion Rubber Company, along with many residential buildings. 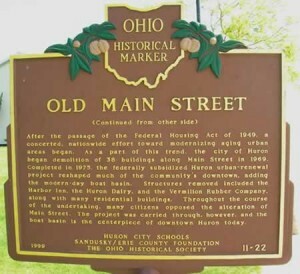 Throughout the course of the undertaking, many citizens opposed the alteration of Main Street. The project was carried through, however, and the boat basin is the centerpiece of downtown Huron today.